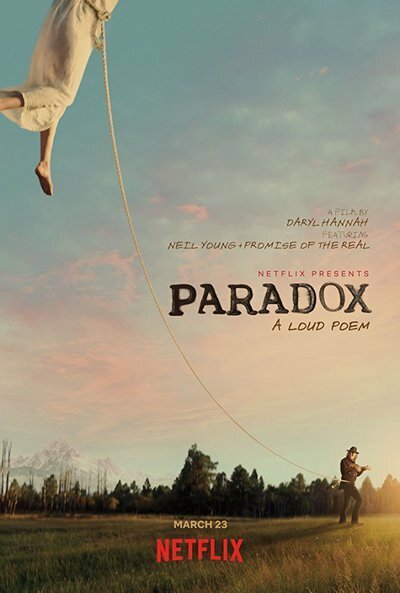 Once upon a time, a film like “Paradox,” a vaguely hallucinatory sci-fi/Western hybrid with legendary rocker Neil Young at its hazy center, would have found its natural home on the midnight movie circuit. Alas, the midnight movie scene is practically dead, and it is therefore instead debuting on Netflix, which will at least make it more convenient for its target audience of Young completists, people too stoned to make it out their front doors and those who felt that “Masked and Anonymous” was far too lucid and commercial-minded for their tastes. Then again, even they may find that this collection of half-baked scenes, inscrutable imagery and, yes, a couple of splendid musical performances wears out its welcome long before its conclusion (despite only clocking in at a less-than-expansive 73 minutes). Set in a vaguely defined future in which the world has gone back to nature, the film finds Young as one of a group of outlaws who spend their days mining for discarded technological artifacts like cameras and computer keyboards. They mutter poorly recorded pseudo-profundities to each other such as “Things have to go south before they can go north” and “It’s days like this I miss the old days” while sitting around a campsite or in an outhouse that proves to be an unfortunately apt visual metaphor. Actually, the other people in the cast, which includes Young’s recent musical collaborators Promise of the Real (a group whose members include Lukas and Micah Nelson, sons of Willie) and his longtime manager Elliott Roberts, are the ones who mostly do all that while Young sits by himself, enigmatically strumming on a guitar. (He does eventually team up with Willie Nelson for a brief interlude in which they rob a seed bank.) Eventually, a group of women turn up in a bus to provide the menfolk with bushels of produce and an eyeful before disappearing once again. It all ends, as it must, with the cast wandering off into the hills singing a bit of “Happy Together” before the credits roll (not that Netflix will allow you to actually see them, of course). The best thing about “Paradox” by far, inevitably, is the music, which combines some stone Young classics with newer material. Granted, the way that the film leads into these sequences is as befuddling as everything else (footage from Young's performance at the massive Desert Trip 2016 festival is just dropped in without explanation) but few will mind too much since they lead to such moments as a solo Young running through an organ-backed take on the warhorse “Pocahontas” and then ripping through an extended take on “Cowgirl in the Sand” by Promise of the Real, who demonstrate the energy of his longtime backup group Crazy Horse without the usual degree of willful sloppiness. (Whether this constitutes an improvement or not will be for you to decide.) During a campfire scene, Lukas Nelson sings his dad’s classic “Angel Flying Too Close to the Ground” in what is the closest thing on display to a genuinely touching moment. Young also supplies a guitar score that is also effective, though it pales in comparison to the majestic music he contributed to Jim Jarmusch’s “Dead Man.” It used to be that one would see the movie and then buy the soundtrack. Here, you can easily skip the first step and go directly to the second, although those who only have “Greatest Hits” and “Harvest” in their music collections may want to think twice about that. Look, I am a massive Neil Young fan and I have even liked much of the film work that he has done throughout his career, ranging from his stunning trio of concert movies in collaboration with Jonathan Demme to his self-directed works such as the seminal concert film “Rust Never Sleeps” (1979) and “Greendale” (2003), a far more satisfying stab at a surreal eco-musical melange. Hell, I even liked his brief non-musical appearances in the underrated Alan Rudolph films “Made in Heaven” (1987) and “Love at Large” (1990). In theory, I should be the perfect audience for something like “Paradox,” and yet even I find it to be little more than the messy visual record of some friends screwing around in the mountains for a few days. Perhaps under the right pharmacological circumstances, it might have some fleeting value but for the most part, it is destined to be, outside of brief mentions in future Young biographies, as quickly and decisively forgotten in the grand scheme of his career as “Give My Regards to Broad Street” is to Paul McCartney’s.